Valentine's Day events are happening all across the city, including the new Mother's Bistro and Bar at Embassy Suites Hotel at 121 S.W. Third Ave.
On Valentine's Day, a person's style can go lots of ways depending on mood and bank account: Stay tucked in at home and order a heart-shaped pizza; splurge on a three-course dinner with bubbles and champagne in a candlelit restaurant, or sling Cupid's arrow into a can of Baerlic Brewing's Pancake House all by your lonesome. 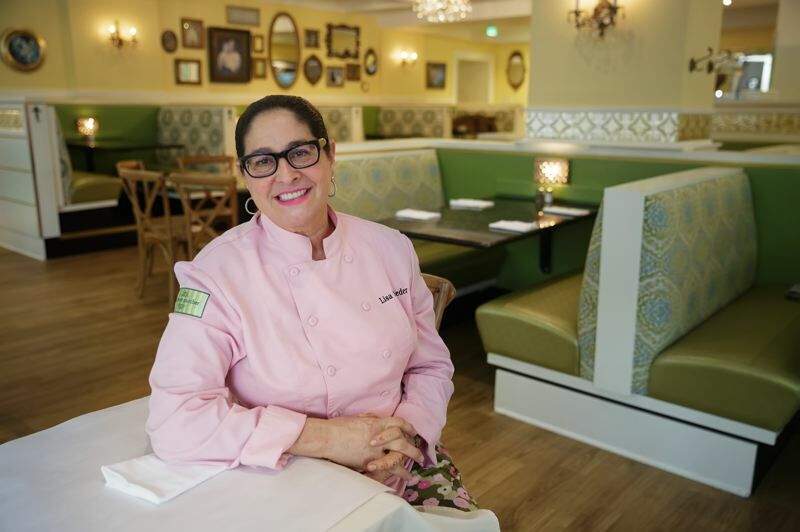 After 19 years in its original spot, chef Lisa Schroeder, the tour de force behind Mother's Bistro and Bar, moved her staff and restaurant to a grand new space at the Embassy Suites Hotel (the historic Multnomah Hotel to Portland historians) at 121 S.W. Third Ave. The reason, Schroeder says, is so "Mother's Bistro can live on forever." Breakfast is served 7 a.m.-2:30 p.m. Monday-Friday and 8 a.m.-2:30 Saturday-Sunday. Lunch is served daily 11:30-2:30 p.m.; and dinner is served 5:30-10 p.m. Monday-Thursday and 5-10 p.m. Friday-Sunday. One of the best things about the new Mother's? No more waiting for a table. But on the off chance there is a line, Mother's staff serves their guests coffee in the adjacent hotel lobby, where comfortable wingback chairs await. The new, l-shaped dining room is butter yellow and brings many of the best touches from the previous place: gilt-framed mirrors hung salon-style, wall sconces and chandeliers. The pastry case, where Mother's host Carter Isom was stationed on a recent night, is filled with house-made desserts like tiramisu, cheesecake and coffee cake. Lunch and dinner menus feature the nurturing Italian and Jewish comfort foods diners expect and depend upon: meatloaf, pot roast, matzo ball soup and schnitzel. New additions include a few healthy options like bistro bowls, but that's never been the point of Mother's. Appetizers such as mini hotdogs wrapped in pastry dough and lox spread on crostini had guests crying out for mama during a recent visit. So grab a cozy banquette and raise a glass to the new Mother's, where it's always been about the love. When a downtown Portland fried chicken cart made the jump to a full-size restaurant, it became the Waiting Room, now one of the city's best places for fried chicken, at 2327 N.W. Kearney St. For Valentine's, the Waiting Room has created a three-course fried chicken, caviar and bubbles menu in addition to its regular dinner menu. It includes a bottle of sparkling wine, a first course of American sturgeon caviar with deviled eggs, hush puppies and buttermilk dressing, a second course of their famous fried chicken with grilled lemon, hot sauce and smoked honey with a choice of a side dish, and finishes with a chocolate cremeux with chicory mousse and candied pecans. Maybe you've been married awhile and you need to share a bit more than laundry and commutes. Beginning this month, Steven Smith Tea hosts daily Tea Times with a complimentary Gaiwan tea service at its cozy space tucked away at 1626 N.W. Thurman St.
Gaiwan is a traditional, small-pot brewing style that brings out the tea's subtle flavors. Also new at Smith's other location: each Friday the Smith team hosts free,45-minute tours of their expanded manufacturing space in Portland's Central Eastside. Tours begin at 3 p.m. and are limited to 12 people. For something a bit special, bring your beer lover a four-pack of Mouth Pillow from Sasquatch Brewing Co. This lusciously soft IPA lives up to its name. Well-balanced, this hazy IPA uses milk sugar (lactose) to create that extra fluffy taste. Packaged in cans, Mouth Pillow is available for purchase at better beer aisles and the Sasquatch Brewery and Taproom, 2531 N.W. 30th Ave., and in the original brewpub in Southwest Portland's Hillsdale neighborhood. If you really love your Valentine, we recommend Baerlic's Pancake House Imperial Stout or Eldo & Friends' hazy IPA. And make way for the bruts. La Brut, a sparkling IPA from Old Town Brewing, rises to the top of this brutish new breed of dry beer. Meanwhile, coming soon to the north end of Northwest 23rd Avenue: Portland favorites Pine State Biscuits (located in the new George Besaw building) and Ruby Jewel Ice Cream have each leased space on the western edge of Slabtown.